← Are You Martha or Mary? Peyton pointed at the once barren-looking tree in the school yard. During the winter months, its branches had been empty, unadorned with offerings of beauty. It seemed like overnight, the tree changed. We left school at the end of the day, not even pausing to glance at the tree, believing there was nothing there to see. Day after day we passed the tree, thinking about ourselves and our circumstances. Day after day the tree stood, lifting her arms to the heavens, even though she seemed empty. And I walked right by, not seeing the miracle in the tree. The miracle was that even though the tree looked empty, there was life on the inside. God wasn’t through with the tree. He was at work, ready to make her new. We came back to school one morning to find that the “sleeping” tree was now covered in beautiful blossoms, announcing to the world that spring has arrived. 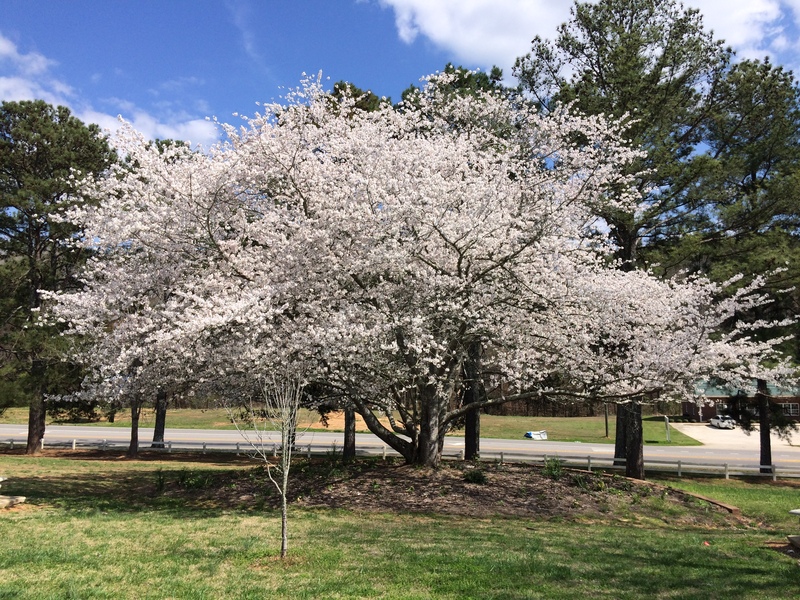 God had given the tree a coat of spring. He makes all things new. Do you ever feel like the winter tree? Barren, empty, exposed? Nothing to offer, no beauty for others to see? Do you remember times when you were full of life and long for those times? God has a promise for you, friend. You may not see it coming. He is making all things new. The seasons, the times, the trees, the flowers, and yes, even you. Lift up your branches! Get ready to bloom! He is ready to make you new! How is making you new? This entry was posted in Devotionals and tagged He makes me new, Isaiah 43:19, Lamentations 3:22-23, Paige Givens, Psalm 40:3, spring, trees. Bookmark the permalink. Paige, I got by to visit earlier than I thought! This is BEAUTIFUL friend. You began with 2 of my favorite verses. God is truly doing a new thing in me: Twitter, a new Facebook page, and a new blog all under 5 months. And He is confirming that His time is now for me to bloom like that tree. Your writing is as pleasant as Spring. And I am blessed to come over and enjoy it today. Thank you for taking a chance and following back. Much love my Sister! Helps me slow down and open my eyes to all He is doing! Love it! This has spoken volumes and I have shared it with several others! The funny thing is that the morning I read your post, I was looking out at one our trees with the buds just forming and thinking that it was being made new! And then God fleshed it out with your blog! Thank you! Dawn I’m so glad and excited that it spoke to you! Thank you for reading and thank you SO MUCH for sharing. Happy Easter! I love how spring reminds us of the life and newness the Lord gives! Seeing the flowers start to bloom and the trees bud encourages me to search my own heart for areas that need revived. I agree Shannon. It’s a good time for renewal, isn’t it? Thanks for stopping by! Thanks so much for commenting.